This is the outdoor Diorama of the Pleistocene megafauna that would get stuck in the mud around the salt licks. It's in need of a paint job, but still looks cool. Included are the American Mastodon, Mammoth, Harlans Giant Ground Sloth, and Bison. 1. This area contains a natural salt lick. A salt lick is an area of natural salt and sulfur springs that animals can go and lick mineral nutrients. Salt licks provide herbivores with crucial minerals they cannot normally ingest by eating plants alone. 2. This area has been known to contain "Big Bones" since the first Native Americans came into the area. View of Big Bone Creek. 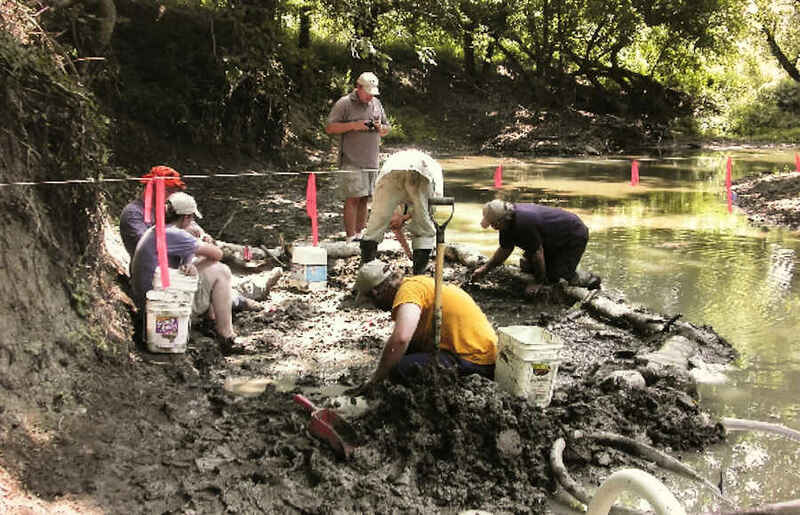 Here, the Pleistocene fossils and Native American artifacts erode from the banks and muddy bottom. Why Are There Ice Age (Pleistocene) Megafauna Fossils Here? 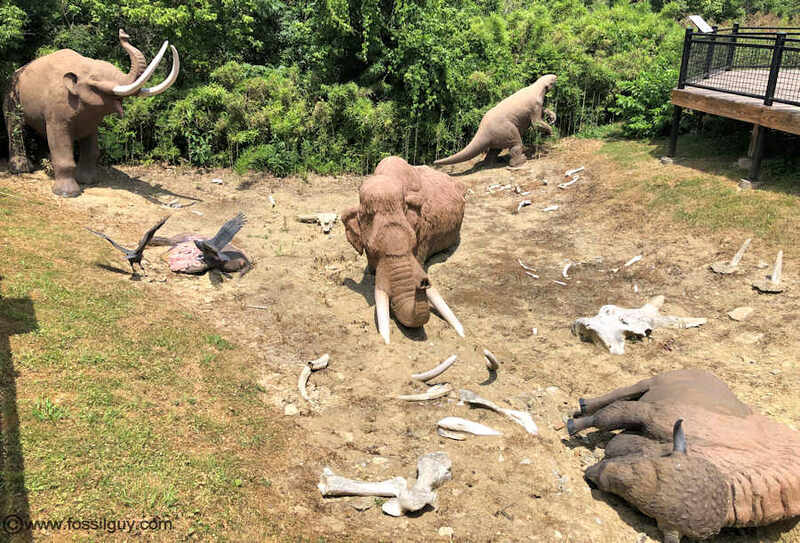 The perfect conditions for Pleistocene fossil preservation at Big Bone Lick were created during the Wisconsian Glacation - The last glacial event in North America. During the Wisconsian glacation event, most of Ohio was covered by a large ice sheet. When it retreated, it left behind many lakes that slowly drained. 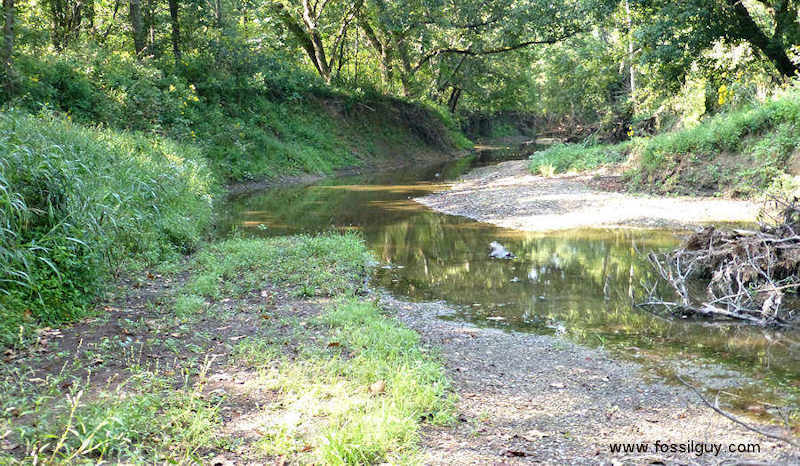 One drainage basin went into Northern Kentucky at Big Bone Lick. This created very swampy conditions. Big Bone Lick also has always had natural salt and sulfur springs (which can still be seen today). Animals would come from all over the area to this natural salt lick. They would sometimes get stuck and sink into the mud, which would preserve their remains. Over thousands of years, large quantities of animals have been preserved at Big Bone Lick. Notable animals that have been preserved include Giant Ground Sloths, Mammoths, Mastodons, Stag Moose, Horses, and Bison. The sheer quantity of animals preserved here rivals that of the Rancho La Brea Tar Pits in Los Angeles. A picture of salt deposits from the natural salt springs of Big Bone Lick. Although Big Bone Lick had always been known by the Native Americans to contain bones of huge animals, it wasn't until 1739, that the first westerner discovered the fossil bones. Charles LeMoyne de Longueui, commander of French and Indian Troops from Canada, collected some of the fossils and shipped them back to France for study. That shipment of fossils peaked the curiosity of many naturalists throughout Europe and North America. From that point on, thousands of bones have been removed from the site. Notably, in 1807 President Thomas Jefferson sent Americas first paleontology expedition to the salt lick; hence the title "Birthplace of American Vertebrate Paleontology." The fossil collecting expedition was headed by General William Clark, who had previous experience collecting fossils during the famous "Lewis and Clark" expedition. Bootherium bombifrons: Harlan's muskox, Bison antiquus: Extinct American Bison, and Cervalces scotti: Stag Moose. Picture of Sloth fossils on display at the Museum. 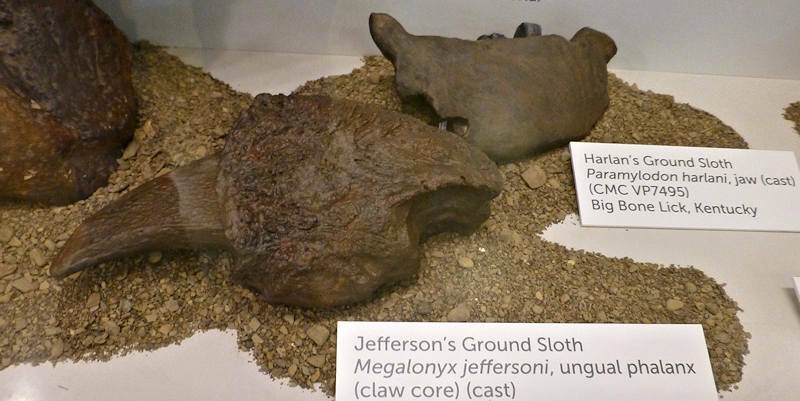 Displayed of casts of a claw from Jefferson's Ground Sloth, and a jaw fragment from Harlan's Ground Sloth. 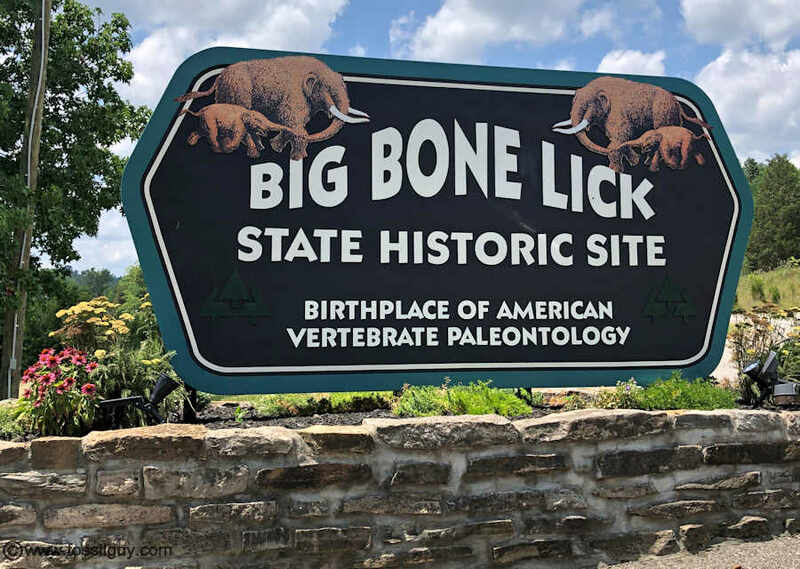 Big Bone Lick is a great park for Paleontology enthusiasts. 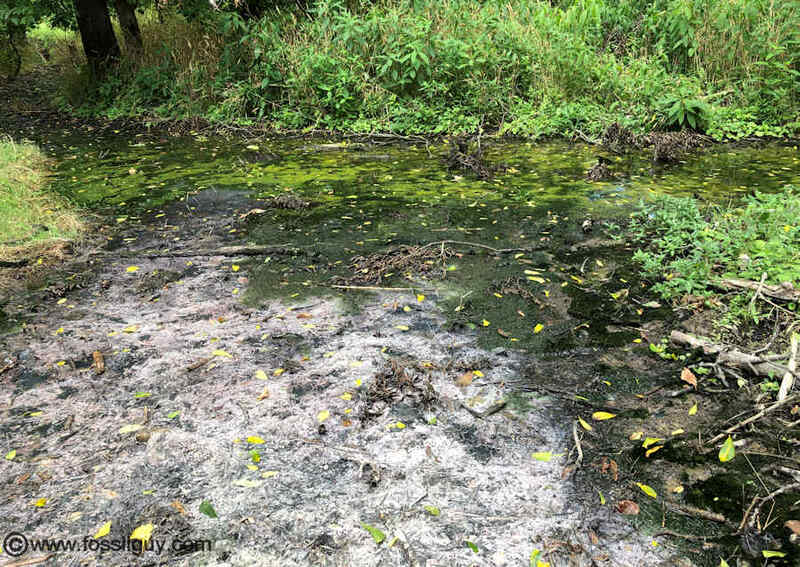 Although, for good reasons, it is illegal to disturb any fossils and artifacts, it has hiking trails through the creek and salt licks where the fossils come from as well as a museum with many fossils on display. Big Bone Lick State Park is located in Northern Kentucky, just south of Cincinnati. The Park Grounds are open all year long. Along with the Paleontology and Archeology musuem, there are 4.5 miles of trails, including a nice "Discovery Trail" running through the salt lick and the creek where the fossils are found. At various places there are informational signs about the area, its history, and the paleontology. 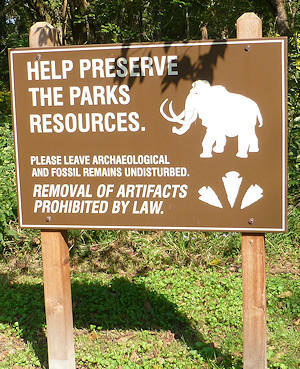 Remember, you cannot collect or disturb fossils and artifacts in the park. However, the occasionally have volunteer dig days where people can help excavate fossils and artifacts. The park has a nice campground with showers, rest rooms, laundry facilities, a swimming pool, and miniature golf. There is also a small herd of Bison that are easily visible by following signs to a viewing area. For more information, here is a link to the Official Park Website. Image of an exavation at Big Bone Lick from one of the parks informational signs. Equus sp. cf. E. complicatus "Complex-toothed horse"
Few carnivores are found at the lick. Two include: Ursus sp. "Bear" and Canis sp. "Wolf"
Although fossil carnivores are lacking at Big Bone Lick, they were probably present and feeding on the herbivores that frequented the salt lick. These carnivores would eat the herbivores and would not likely die in the lick. Therefore, the fossils are not present. Large carnivores in Kentucky at this time would have been American lions, Saber-toothed cats, Dire wolves, Giant Short-faced bears, and Jaguars. The most abundant animal found at Big Bone Lick is the modern bison. Native Americans would hunt them at the lick. Over time, large amounts of these butchered bones would accumulate. Ground Sloths were group of giant sloths related to today's two and three toed sloths. However, they were much larger, with some reaching the size of elephants. They also lived on the ground and not in trees. Ground sloths evolved in South America and spread throughout North America during the Ice Ages. They were herbivores that had very large claws that could dig up roots and dig burrows. They had very blunt teeth for chewing vegetation. All ground sloths became extinct at the end of the Ice Age around 10,000 years ago. Jefferson's Ground Sloth is the larger of the two ground sloths found here. It reached a size of around 9 feet. 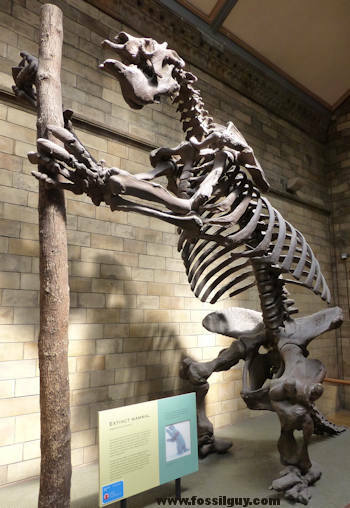 Jefferson's Ground Sloth specialized in eating branches from trees. It could stand on its hind legs and tear off branches with its huge claws. Herlan's Ground Sloth is the smaller ground sloth found here. It reached a size of around 6 feet. 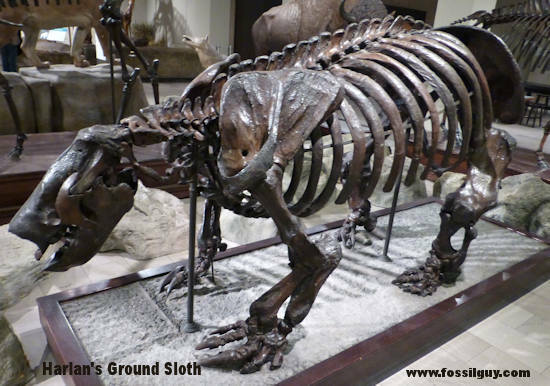 Harlan's Ground Sloth was probably a grazer and fed mainly on grasses. 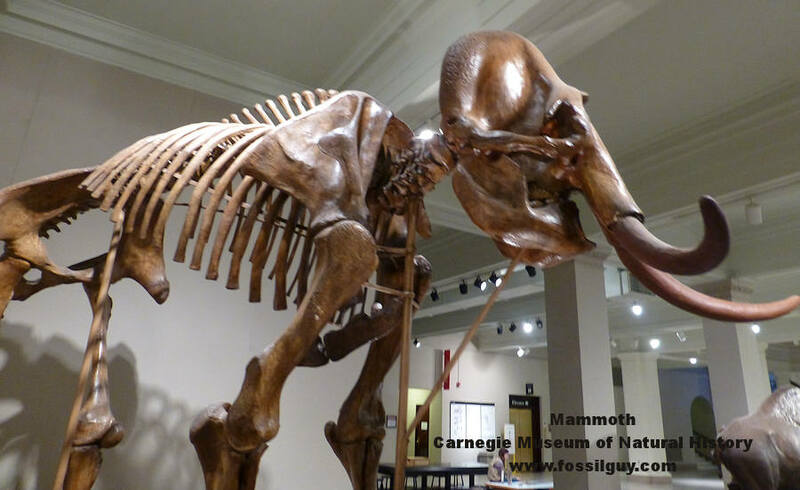 This is an image of Harlan's Ground Sloth on display at the Carnegie Museum of Natural History in Pittsburgh. A Mammoth molar from Big Bone Lick on display at the Museum and Discovery Center. Mammoths are a type of elephant that lived during the Ice ages. They have very long, curved tusks and long hair. Mammoths tended to live in plains and fed on tough grasses. Their molars, similar to today's elephants, have many small grooves in them, which allow them to grind up grasses. Most mammoths died out at the end of the Ice age around 10,000 years ago. 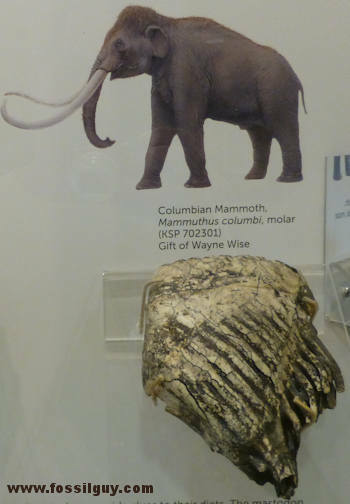 The left image shows a mammoth tooth at the Big Bone Lick museum. The Columbian mammoth was the largest of the mammoths. It reached about 13 feet tall at the shoulders, which is larger than African elephants. Columbian mammoths also had the longest tusks. One specimen had curved tusks that were 16 feet long! Columbian mammoths generally lived in warmer environments than other mammoths, so they probably had less hair. The Wooly mammoth was slightly smaller than the Columbian mammoth. It was around the same size as African elephants. These mammoths generally lived in colder areas and had a thick coat of coarse hair covering their bodies. Their tusks were longer and more curved than African elephants. Some wooly mammoths survived well past the Ice age. A small population on St. Paul Island in Alaska survived until around 3750 BC, while small mammoths on Wrangel Island in the Arctic survived until 1650 BC, well after the Egyptian pyramids were built! 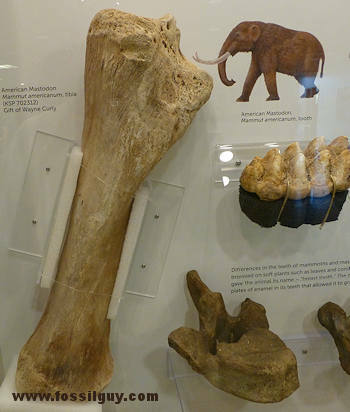 A Mastodon tooth and leg bone from Big Bone Lick on display at the Museum and Discovery Center. Mastodons were more primitive than mammoths, and less closely related to today's elephants. They were slightly smaller, around 8 or 9 feet at shoulder height, but were more muscular. Mastodons appear to have been specialized to browse on leaves and branches of trees. Their teeth have very high enamel ridges along them, ideal for grinding tough vegetation like small branches. They probably lived in more wooded areas, whereas mammoths probably lived on steppes and plains. Like most Pleistocene mega-fauna, mastodons became extinct at the end of the last ice age, around 10 or 11,000 years ago. 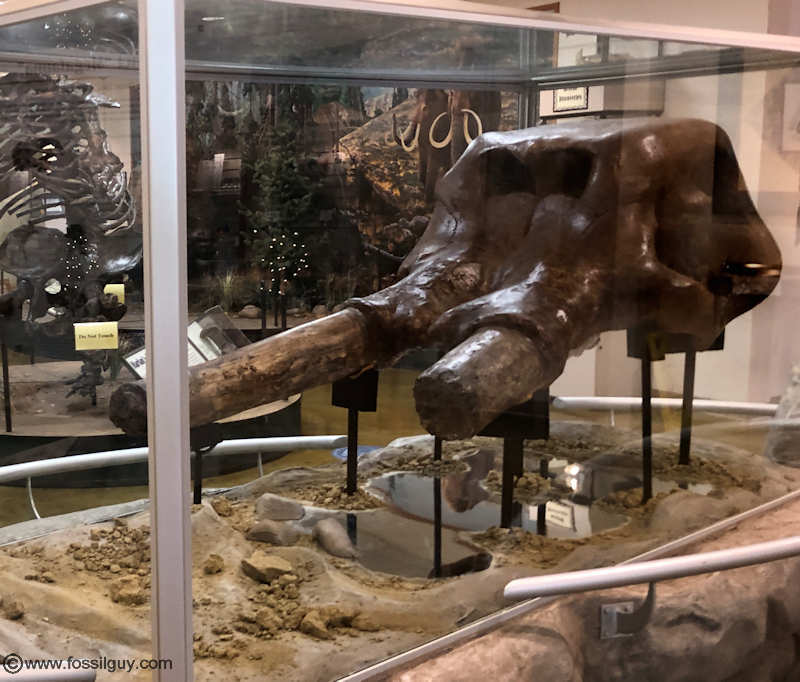 The left image shows a Mastodon tooth and leg bone at the Big Bone Lick museum. This is the most common and well known mastodon. It probably had a thick coat of coarse hair, similar to that of the wooly mammoth. It is thought that human hunting helped bring this great animal to extinction. A Mastodon on display at the London Museum of Natural History. The Author does a great job discussing the historical significance of Big Bone Lick from the first French explorers to Thomas Jefferson and even Benjamin Franklin. He also does a great job at showing how the discoveries at Big Bone Lick came to be so important for American paleontology, and how early naturalists viewed these fossils and the world the fossils came from. I recommend this to anyone interested in the history and birth of American Paleontology! This Ice Age book first introduces the reader to the fascinating ice ages of the Pleistocene. It then gets into descriptions of the ice age animals of North America. The author includes beasts such as the American lion, giant short faced bear, dire wolf, and the saber toothed cats. Less ferocious animals such as the glyptodont, mammoths, mastodons, giant ground sloths, and camels are also discussed. The author gives excellent descriptions and makes one realize just how wild and deadly North America was only 10,000 years ago! This is a really nice book about the Ice Age animals that lived in your back yard! Although this book is about the Ice age animals of South America, I have included it here because it is such a fascinating book! It's hard to believe the megafauna of South America and North America could be so different... Until the continents collided! The ensuing land bridge caused an invasion of mammals into South America which led to the extinction of the large and bizarre South America marsupials. This book also discusses the paleoecology and biology of each large South American animal. It's simply a fascinating read! Hedeen, Stanley and Faragher, John. (2008) Big Bone Lick: The Cradle of American Paleontology. (Lexington: University Press of Kentucky). The Largest Excavation of Mammoth Fossils on Earth!